The first option for reaching our little island is the “Big White Boat”. Operated by Awesome Adventures this catarmaran ferry departs Denaurau Marina at 8.30am. A complimentary bus services for Awesome Adventures leaves the Airport at 6.50am for Port Denarau. 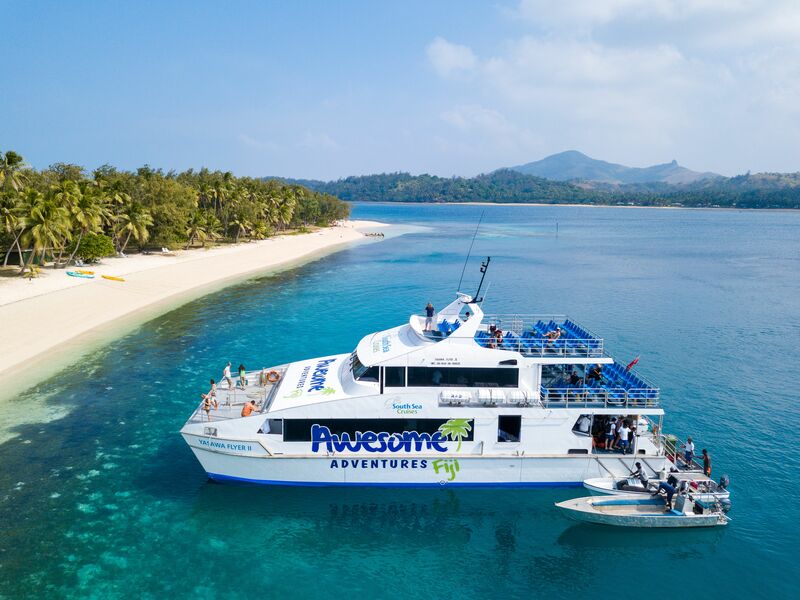 There is also complimentary transfers from all hotels within the Nadi area operated by Awesome Adventures. All you will need to do is to cross check with the information desk, or at the reception of the Hotel you are staying at for pick-up times. Once you arrive at Port Denarau, you will need to check-in your luggage and have it tagged for Paradise Cove, then queue to collect your boat tickets from the counter. If you prefer there is the option for a private mini van transfer from your hotel or the airport for an additional $10 NZD per Adult or $7.50 NZD per child. Please let us know which option you prefer at the time of your booking. The vessel travels up past many islands to the top of the Yasawa chain, then returns that afternoon. It is a great way to see the islands and experience an island scenic tour at the same time! Going north up the island chain, the boat stops at Paradise daily at approx.11.30 am then carries on north to the top of the island chain (and our sister resort, The Blue Lagoon Beach Resort). Returning south the boat stops at Paradise at approx.2.45pm before returning to Denaurau Marina at approx 5.45pm each day. We are happy to help you book with Awesome Adventures or with any issues relating to your arrival or departure details. The Adult fare is $126 NZD and the cost for a child ( 5 - 15 yrs) is $63NZD , under 5 years are free.